Persons proficient in describing the surface of the earth. 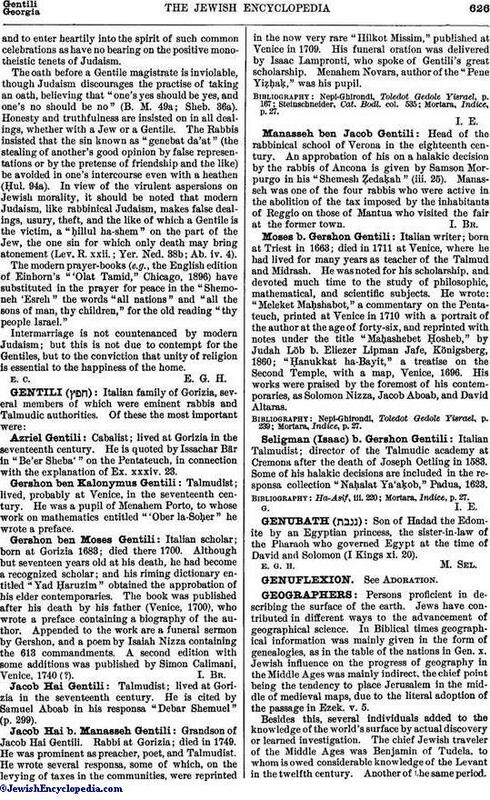 Jews have contributed in different ways to the advancement of geographical science. In Biblical times geographical information was mainly given in the form of genealogies, as in the table of the nations in Gen. x. Jewish influence on the progress of geography in the Middle Ages was mainly indirect, the chief point being the tendency to place Jerusalem in the middle of medieval maps, due to the literal adoption of the passage in Ezek. v. 5. Besides this, several individuals added to the knowledge of the world's surface by actual discovery or learned investigation. The chief Jewish traveler of the Middle Ages was Benjamin of Tudela, to whom is owed considerable knowledge of the Levant in the twelfth century. Another of the same period.Pethahiah of Regensburg, traveled through Poland, the Crimea, and Mesopotamia. For others see Travelers. The modern history of geography begins with the establishment of an observatory at Sagres, in south-western Portugal, by Prince Henry the Navigator. He appointed as the chief director of this establishment Jafuda Cresques, son of Abraham Cresques of Palma, capital of Mallorca in the Balearic Islands (see Cresques lo Juheu). As the author of the Catalan map, Cresques was in a measure the founder of modern chartography, having made use for the first time of the results of the recent discoveries of Marco Polo in Farther Asia. Jews were especially prominent in connection with the discovery of America, and almost equally so in the attempt to reach India by the eastern route, when Pedro de Covilhäo was sent to discover the country of Prester John. 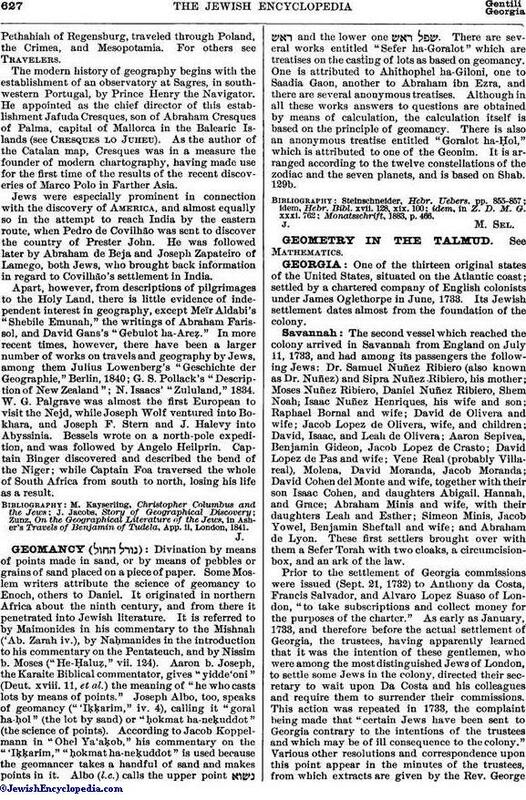 He was followed later by Abraham de Beja and Joseph Zapateiro of Lamego, both Jews, who brought back information in regard to Covilhäo's settlement in India. Apart, however, from descriptions of pilgrimages to the Holy Land, there is little evidence of independent interest in geography, except Meïr Aldabi's "Shebile Emunah," the writings of Abraham Farissol, and David Gans's "Gebulot ha-Areẓ" In more recent times, however, there have been a larger number of works on travels and geography by Jews, among them Julius Lowenberg's "Geschichte der Geographie," Berlin, 1840; G. S. Pollack's "Description of New Zealand"; N. Isaacs' "Zululand," 1834. W. G. Palgrave was almost the first European to visit the Nejd, while Joseph Wolf ventured into Bokhara, and Joseph F. Stern and J. Halevy into Abyssinia. Bessels wrote on a north-pole expedition, and was followed by Angelo Heilprin. Captain Binger discovered and described the bend of the Niger; while Captain Foa traversed the whole of South Africa from south to north, losing his life as a result. Zunz, On the Geographical Literature of the Jews, in Asher's Travels of Benjamin of Tudela, App. ii, London, 1841.